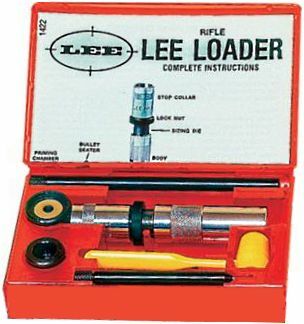 Lee Loader Reloading Kits are small and portable, but have all the tools needed for reloading. 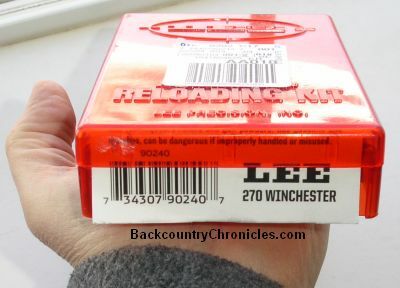 Lee Loader reloading kits are great for anyone that wants to try reloading without spending a lot of money for equipment because each kit only costs about $30. I bought the 45 auto, 7mm Remington Magnum and 270 Winchester kits for that purpose. But these kits are also perfect for Preparedness and survival kits, because they are small enough to throw in a “Bug out Bag” and they are easy to hide. A reloading kit is not necessary for short term survival, but could be very important if TSHTF. The more advanced and expensive single or multi-stage reloading equipment load faster and more accurately, but are not portable and will be hard to hide from thieves or anyone else searching for your weapons and ammunition. Lee Loader kits are small enough they can easily be carried with you or hidden on your property. Lee Loader makes a variety of kits for reloading many popular pistol and rifle ammunition. 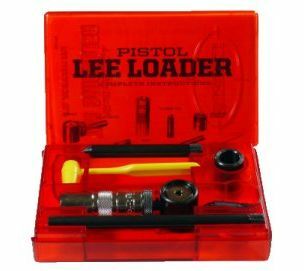 Lee loader kits have all the necessary tools needed to prepare and reload cartridges. All you need are empty cartridges (spent cartridges fired from your gun are best), primers, bullets and powder. You will also need a small hammer, rubber mallet or heavy stick, which are not supplied. There are seven steps in the reloading process, but I suggest you also take careful measurements or have a factory bullet on hand for comparison of the final product. I’m only going to list the steps here, because complete instructions are included with each kit. 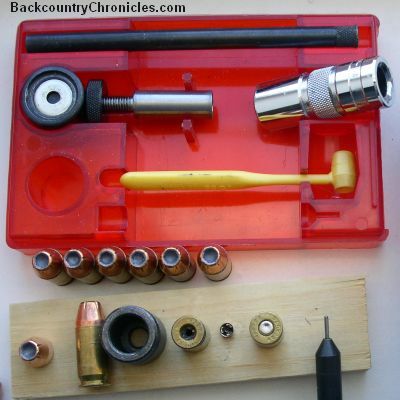 Reloading 45 Auto (ACP) with Lee Loader Kit. Carefully tap the primers into position and make sure no powder is around. Follow the directions that come with the powder very carefully. Until you have experience with a certain load, be very conservative with the amount of powder. It is better to start with bullets that are under powered than to blow your gun up. To start, adjust the Bullet Seater tool to be a little high, then slowly adjust until the bullet length matches the factory loads you have been shooting. After a little practice, you will get the hang of using the tools and reloading. I probably go slower than most, but can reload one cartridge every 40-50 seconds. I could go faster, but I prefer to be careful and make sure I do a good job when reloading. I was very conservative with the powder the first time I reloaded for my 45 auto. The bullets fired, but didn’t have enough kick to recycle the next round. I went back home and got the Lee Loader kit and the loading components and returned to the range. I used the tailgate of the truck as a table and reloaded two cartridges at a time until I found the right amount of powder. You can’t do that with any other reloading equipment. Is there a loader kit for .22 magnum ammo? For the average re-loader, not really. Since 22 mag is a rim fire cartridge, you can’t simply punch out the old primer and push in a new one. You would have to find a source for the priming material. Rim fire cartridges are made by either dropping small, wet primer pellets (including powdered glass) into each bullet case, pushing into the case with a pin and then spinning each case at high speed to spread the primer across the whole surface of the rim, or by mashing a wet putty (primer) into position. The process is time consuming (expensive) and the concussive primer material is dangerous when dry. Since the side of the 22 case is severely dented when fired, I’m not sure how many times a dented case could be reloaded before it would cause too many malfunctions. I’m sure you could come up with some kind of die to reshape the cases, but by the time we worked all that out, we wouldn’t be saving much money and not sure we would be gaining any accuracy. It would have to be a labor of love. I have a 30-06 Ackley Imp. I am looking for a Lee loader for this cal. I know it was made at one time, but now it is imposible to find. Please any HELP. Ray: I can’t find the 30-06 Ackley Improved dies either. I did find something about 280 Ackley Improved dies at the Lee Loader Site, but nothing about the 30-06. I finally found a LEE COLLET 2-DIE NECK SIZER SET at Brownells (Click here). But it was not listed under the name “30-06 Ackley Improved“, but was listed as “Improved 40” (for the 40° shoulder angle). I have empty cases, bullets and primers, powder and Lee classic 30 06 loader, offer me a price for all. I sold my 30 06 to buy .450 bushmaster rifle. I don’t have a 30 06 either. Perhaps Ray or someone else does and will make you an offer. I will provide emails if you get to that point. But you will probably have more luck advertising at your local shooting range or hunt club.